A relaxing walk from hilltop village to hilltop village via Joucas, a sleepy hamlet and artist's paradise. This lovely walk takes you across the valley floor to the hilltop village and artists’ colony of Joucas, which you can explore at your leisure before making your way along a rocky path through shrub which offers exceptional views of the surrounding landscape. Finally, follow a peaceful forest trail and a steep but short section on paved roads to the lovely village of Gordes. Hugely popular with tourists in the summer, Gordes is recognized as one of the prettiest villages in France, and its warren of narrow streets clustered round the castle are host to many fine restaurants and specialist shops. 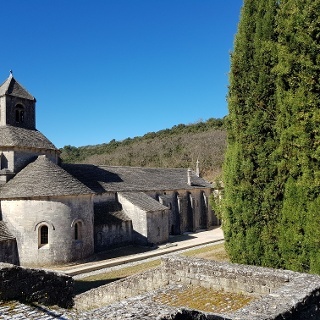 There are a number of options to walk into Gordes, and we have documented the one that involves the least walking on what can be very busy tourist roads. The path we have chosen will also bring you through a wonderful section of ruins which have been embellished with creative art instalments by the locals. Take some time to explore Joucas. It will be of particular interest to art fans. Visit the La Labyrinthe d’art show room (free entry) to view some interesting sculptures. Today you will be walking on roads for the most part, these are small quiet country roads, but do still be aware of traffic. Take care on the path after Joucas as it is rocky, especially on the descent to the forest. Although the rocky descent to the forest just before Gordes is short, some may find walking poles beneficial to aid descent. 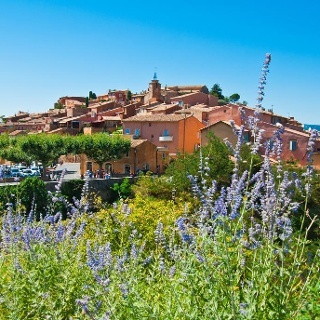 Roussillon is well served with shops that will allow you to stock up for the day with food and water. Joucas has two restaurants and a small general store (all closed on Mondays) and Gordes has a wide variety of shops, bars and restaurants covering all tastes and budgets. We recommend always starting your day carrying at least 2 litres of water per person per day, and maybe even more on particulalry warm or longs days. 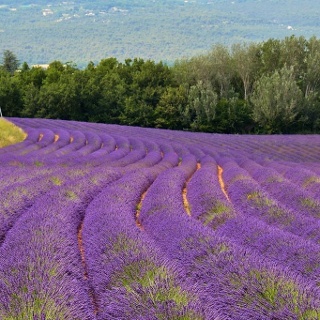 Provence can become very hot and it is important to stay hydrated. Joucas has a fine church which is open to visitors throughout the summer months. Located just off the small square beyond Place de La Fontaine, it boasts fine freezes behind the alter, and has some remarkable modern statues located on the square at the entrance. Joucas is home to a number of artists mostly focussing on sculpture. 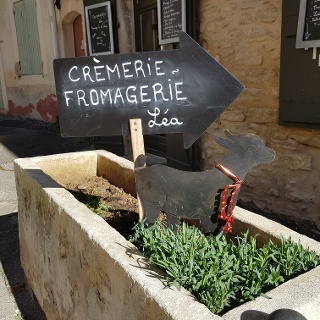 Currently, a sculpture garden is being created on the lower reaches of the village visible from the church, and the gallery named the showroom named La labyrinthe d’art (just off La Pace de la Fontaine) is worth a visit. This Castle was rebuilt in 1525 and already existed in 1031. This well-restored and preserved building combines architecture from the troubled Middles Ages and the Renaissance era. The monumental fireplace that decorates the Hall of Honour was classified historical monument in 1902, as was the rest of the castle in 1931. There is a small entrance fee. More details can be found at the Tourist Information Office at the castle entrance. Today’s walk finishes here. 0.00 km – Starting in the ‘Place de la Mairie’, walk down the Rue Richard Casteau as it descends. 0.05 km – TURN LEFT at the bottom of Rue Richard Casteau onto Rue de la Fontaine. Pass the ‘Moulin a Huile Historique’ on your left (information board in French and English). Continue STRAIGHT AHEAD on this paved, descending road. 0.20 km – Come to a small roundabout. Continue STRAIGHT AHEAD on the paved country road. Follow this road for the next 2.5km. 2.00 km – Continue STRAIGHT AHEAD as the road swings left, ignoring the road on the right named ‘Chemin de Romieu’. 2.40 km – Cross a small bridge and continue STRAIGHT AHEAD, following the same road. 2.70 km – Arrive at a T-junction. TURN RIGHT onto ‘Route des Lavandes’, be aware of passing traffic. 2.90 km – TURN LEFT onto ‘Chemin de Murs’, following the signpost for ‘Cavaillon’. Continue STRAIGHT AHEAD on the ‘Chemin de Murs’, ignoring any paths that branch off to the left or right. 3.60 km – The path turns from paved/gravel to a dirt track between fields of vineyards. Continue STRAIGHT AHEAD. 4.00 km – Come to a paved road. TURN LEFT onto it and follow. 5.30 km – TURN RIGHT, following the road through a cluster of buildings. TURN RIGHT again to leave the hamlet on a paved road. 5.50 km – Continue STRAIGHT AHEAD following the road as it swings left, crossing a bridge with small stone walls. 5.60 km – Arrive at a larger paved road. BEAR LEFT, following the road. There are markers on the trees to your left. 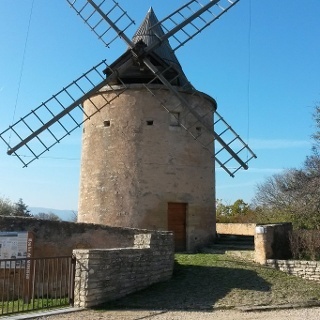 5.80 km – There is a picturesque windmill on your right hand side. Cotinue STRAIGHT AHEAD. 5.90 km – TURN RIGHT and ascend, following the pavement/sidewalk into the village centre. 6.20 km – Arrive at the Place de la Fontaine, TURN RIGHT to reach the fountain and a yellow walker’s sign named ‘Joucas 244m’. From here, if you wish to explore the church, head left. Otherwise, Continue STRAIGHT AHEAD ascending the stone steps that wind their way up to the top of the village. 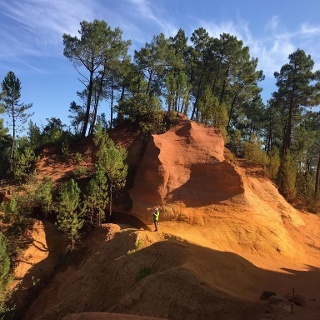 6.40 km – Come to a yellow walker’s signpost named ‘Aires Chateau 269m’. From here, TURN LEFT following signs for ‘Veroncle’ (2.4 km) and the red/yellow marker. The path is wide and rocky, and surrounded by short shrub vegetation. The views from here of the surrounding Luberon valley is beautiful. The red/yellow markers can be found on the rocks underfoot. 6.90 km – Come to a yellow walker’s signpost named ‘La Basse Auvieres 289m’ and a fork in the path. BEAR LEFT following the sign for ‘Veroncle’ (2km). 7.50 km – the path forks again. BEAR LEFT following the more distinguished path. Keep a look out for the markers in rocks. 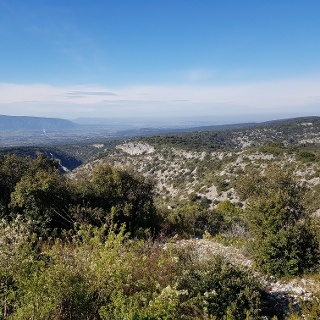 7.60 km – Views of Gordes start to open up ahead of you. Arrive at a yellow walker’s signpost named ‘Baume Brun 314m’. TURN LEFT following the signpost for ‘Gordes’ (4 km) and the red/yellow markers. The rocky path begins to descend. 7.70km – BEAR RIGHT onto the descending path. The path straight ahead is marked with a red and yellow X, meaning it is not the correct trail to follow. Here the path changes in nature from rocky and open to a more gentle forest path. 8.10 km – Continue STRAIGHT AHEAD ignoring the path on the left. Look for the red/yellow markers on trees if in doubt. 8.30 km – Come to a junction in the path. There is an orchard to the right. TURN LEFT and follow the path as it descends. 8.50 km – BEAR LEFT into the wide descending path, continuing to follow the yellow and red markers. 8.70 km – Leave the wide stony path and TURN RIGHT onto a smaller forest path. This could be easy to miss. Keep an eye out for markers on the tree indicating a right turn! 9.00 km – Come to a yellow walker’s signpost named ‘Bois d’Audibert 217m’ and TURN RIGHT following signs for ‘Gordes’ (2.7 km). Shortly after, BEAR LEFT, following the rocky path as it swings left. There is a stone wall to your right. 9.70 km – Ignore the ascending road on your right. Continue STRAIGHT AHEAD on the paved road. 9.90 km – Enjoy views of Gordes directly ahead of you. Come to a road. Cross it and rejoin the stoney jeep track on the other side, this path is called ‘Saint Eyries’. Look out for the red and white markers. 10.50 km – Come to a tennis court. Follow the narrow path directly to the right of the tennis court. 10.60 km – The trail converges with a paved road. Continue STRAIGHT AHEAD. 10.70 km – TURN RIGHT onto the main road. Be careful of passing traffic. Follow the road as it ascends gently. 10.90 km – Arrive at a yellow walker’s signpost named ‘Les Touren 222m’. BEAR RIGHT onto smaller paved ascending road as it diverges from the main road. 11.30 km – Come to a yellow walker’s signpost named ‘Lourdannaud 255m’. Continue STRAIGHT AHEAD, heading to Gordes on the paved ascending road. 11.70 km – At the top of the hill, there is an iron cross on your right. Continue STRAIGHT AHEAD as the road starts to descend. 11.90 km – BEAR RIGHT onto gravel path and the Rue Payée d’Amour, heading toward a cluster of buildings and ruins. Take some time to enjoy the unusual and beautiful ruins and rock formations here. 12.00 km – TURN RIGHT leaving the small cluster of buildings. There are more ruins and a large stone wall on your right. Continue STRAIGHT AHEAD to the end of the road where there is normally a small waterfall running. Take a SHARP LEFT to ascend the cobbled path as it zig zags up the side of the hill. 12.10 km – Here you have the option for a detour to a viewpoint (turn left), a roundtrip of 800m. Otherwise, TURN RIGHT and continue to steeply ascend on small stone steps. 12.40 km – TURN LEFT, still following the red/white markers. The path is now gently ascending. Come to a square with a fountain, the castle, tourist information office, shops and restaurants. Your walk ends here.